Shop online for 124 tomar model trains at discounts up to 46%. Trackside Accessories is the most popular of the 6 tomar model trains categories, then Lighting / Electrical, and Operating Acc.. This is the Dwarf Signal Two Light (green over red) Model Railroad Trackside Accessory in HO Scale by Tomar Industrials.. This is the Target Signal w/LEDs Model Railroad Trackside Accessory in HO Scale by Tomar Industrials.. This is the 3-Light Dwarf Signal Chesapeake & Ohio Style Model Railroad Trackside Accessory in HO Scale by Tomar Industrials.. This is the Vertical Signal Two-Light Model Railroad Trackside Accessory in HO Scale by Tomar Industrials.. 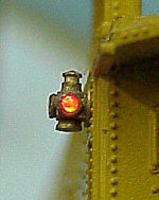 This is the Adlake Marker Lights w/G-G-R Lens Model Railroad Electrical Accessory in HO Scale by Tomar Industrials. This is the Semaphore Signal 3-Position w/Relay Box for Base & 1.5V Bulb Model Railroad Trackside Accessory in HO Scale by Tomar Industrials.. This is the Vertical Signal Three-Light w/LEDs Model Railroad Trackside Accessory in HO Scale by Tomar Industrials.. This is the Searchlight Signal Triple Head Model Railroad Trackside Accessory in HO Scale by Tomar Industrials. This is the Working Crossing Signal Less Gate Pkg(2) Model Railroad Trackside Accessory in HO Scale by Tomar Industrials. This is the Dwarf Signal Two-Light (Yellow Over Red) Model Railroad Trackside Accessory in HO Scale by Tomar Industrials.. This is the Hayes Bumping Post Model Railroad Operating Accessory in N Scale by Tomar Industrials. This is the Vertical Signal Two Head, Three Light Model Railroad Trackside Accessory in HO Scale by Tomar Industrials. This is the Target Signal w/Two Heads Model Railroad Trackside Accessory in HO Scale by Tomar Industrials. This is the Railroad Crossing Signal w/Bell & Quad Lights (2) Model Railroad Trackside Accessory in HO Scale by Tomar Industrials. This is the Railroad Crossbucks With Track Numbers (2) Model Railroad Trackside Accessory in HO Scale by Tomar Industrials. This is the Adlake Marker Lights Yellow & Red Model Railroad Trackside Accessory in HO Scale by Tomar Industrials.. This is the C83 Bumping Post Model Railroad Trackside Accessory in HO Scale by Tomar Industrials. This is the Railroad Crossbucks (2) Model Railroad Trackside Accessory in HO Scale by Tomar Industrials. This is the Illuminated Switch Stand Assembled Model Railroad Trackside Accessory in HO Scale by Tomar Industrials..